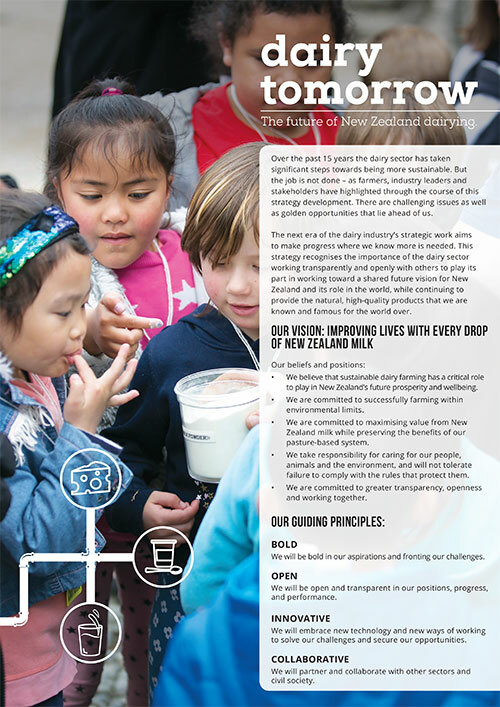 The next era of the dairy strategy recognises the importance of being transparent and open while continuing to provide the natural, high-quality products that we are known and famous for the world over. Over the next decade and beyond, we will work collaboratively with others to achieve the following commitments and goals. Lead efforts to improve the health of our rivers and streams and protect and enhance biodiversity, beginning in 2018 with collaboration with other rural and urban land users, central and local government and communities on strategies and actions toward achieving swimmable waterways. Lead efforts on agriculture’s contribution to meeting New Zealand’s climate change goals through identifying and implementing strategies to reduce or offset greenhouse gas emissions from dairy farming. With communities, government and other land users, develop a blueprint for a 50 year vision of sustainable land use in New Zealand by 2025. By 2025, achieve all farms implementing and reporting under certified farm sustainability plans. Develop benchmarks and targets for international competitiveness, resilience, sustainability and community expectations for our future farm systems to achieve. From 2019 report annually on the performance of research farms and the wider sector against these benchmarks and targets. By 2020, join with government and industry investors to develop and implement a co-funded, sector led ‘National Science Challenge’ for dairying to deliver the next generation of tested, cutting-edge science and technology solutions for future farm systems. By 2025, 10% of dairy farms annually will have completed a whole farm assessment to identify and capture improvements in farm performance, with annual improvements in business performance and resilience measures reported from DairyBase. By 2020, improve data connectivity so that farmers’ need for valid data can be met by authorised data exchange between organisations. Develop initiatives to reduce the risk and impact on farm profitability and productivity, of biosecurity incursions. Maintain zero compromise on the safety or integrity of New Zealand dairy products. Ensure consumers have the choice of New Zealand dairy nutrition by growing New Zealand dairy exporters’ access to open dairy markets to equal 30% of global consumption. 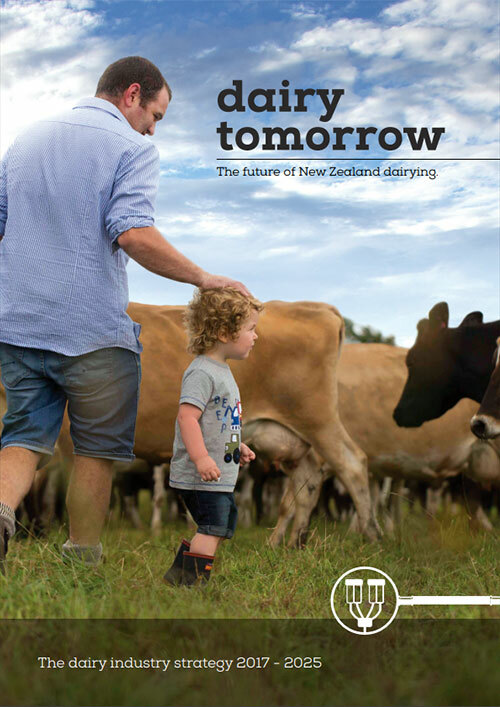 By 2020, implement a strategy to promote the unique value proposition of New Zealand milk. Develop and implement a Framework that ensures every animal is valued and treated with care and respect. By 2023, achieve all farmers implementing and reporting under the Framework. By 2025, ensure all farm businesses have best employment practices and quality work environments operated by vibrant and proficient farm teams. By 2020, implement people initiatives to inspire, attract, grow and retain dairy talent. Ensure everyone gets home safe and well every day. By 2020, implement new programmes to support and integrate new entrants into the sector and our rural communities. By 2020, implement programmes to build and sustain our governance and management skills-base through diversity and leadership. Help strengthen communities through growing community leadership and building stronger connections, including urban-rural relationships. Influence the delivery of infrastructure and services in rural areas that support regional economic and social wellbeing. By 2025, be a highly trusted business sector in New Zealand. Work on implementation is underway. We have been developing actions and strategies to achieve our commitments and goals and starting new projects. Many areas require further engagement with; farmers, the wider primary sector, local government, central government, NGOs, and relevant international bodies, and this is in progress. The partners are leading actions aligned to their mandates and roles. Examples of progress can be found here. Programmes inherited from the previous strategy have been realigned to reflect the dairy tomorrow commitments and goals, and new projects are starting.